When Should You Shift Your Baby From Crib To Toddler Bed? So, are you worried about when to shift your baby from the crib to toddler’s bed? Well, this is the most common question asked by every new parent. Though each baby and parents are different in their approach on upbringing, but one thing is common that every parent knows when it’s the right time to move your baby to a toddler bed. Age that matters in transition! Toddlers adopt the ability to hop over crib when they are around 35 inches tall and this usually happens when the kid is between 18 to 24 months. Though there are some babies who might be hyperactive in their growth and can attempt to climb sooner than their age, but it is always important to maintain a certain timeline. The less adventurous types would not try to come out of crib and might find it a comfortable option. So, you can consider the crib even after the age of 2 for your baby and carry on with it as long as you find it safe. But, a study shows that baby spending a longer period of time in the crib grows an emotional attachment with it as this can make things harder when time comes for transition. One way to understand that your baby is ready for the transition is to monitor the sleeping habit. Supposedly, if you find your baby is not having sufficient sleep and taking less nap, then it is a sign that your baby is no longer comfortable in crib. So, you can probably shift to a toddler bed to offer comfortable bedding. 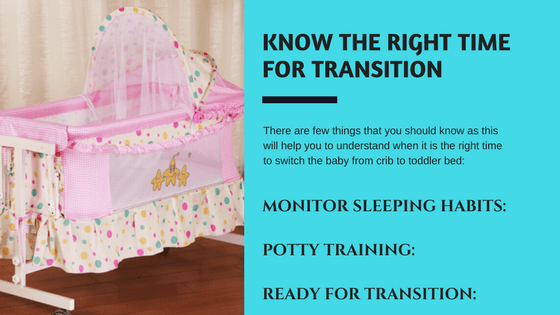 Though it may sound a bit weird, but once the potty training gets started you surely know that it’s the right time to shift your kid from crib to toddler bed. Once the child is potty trained, it signifies that your baby has the ability to use bathroom when need arises. So, if you still keep them in the crib they will lose interest in making use of bathroom. You need to prepare your kid for toddler bed and ensure that while you fall asleep, your child do not roam around the house. This can equally be dangerous as jumping out of crib. Once your baby is ready to accept new bedding, it becomes easier for you to ensure a comfortable sleep throughout the night. Are you really eager to have a hassle-free transition? This can only be possible when your child is equally a part of the process. Make sure that your child has the opportunity to choose his own bed. Today, you will find a wide variety of toddler bed in the market that is quite stunning. Your main objective is to entice the baby and trick them to switch to toddler bed. Choose the right bedding and decorate his room so that it turns out to be really appealing. Don’t force your kid for anything; make your child comfortable to slowly accept the process.